The Runewars Miniatures Game is Here! Posted: Sat Apr 15, 2017 4:05 am Post subject: The Runewars Miniatures Game is Here! When undead legions emerge from their slumber within the Mistlands and cross into the realm of Terrinoth, the Daqan Lords muster their forces and sound the call to war. It is up to you to lead your forces to victory and secure for your kin the future of the realm in Fantasy Flight Game's all-new RUNE WARS MINIATURES GAME! A game of battlefield strategy and tactics for two players set in the Runebound universe, the new Runewars Miniatures Game starter set includes 48 highly-detailed plastic miniatures representing two full armies, a learn-to-play guide, rules reference, lore guide, tokens, dice, terrain pieces, cards, and tons more. Blending classic wargaming rules with modern innovations from hit FFG games like Star Wars: Armada and X-Wing, this game offers a fresh take on fantasy wargaming and is sure to provide hours of awesome strategy gaming for you and a friend. 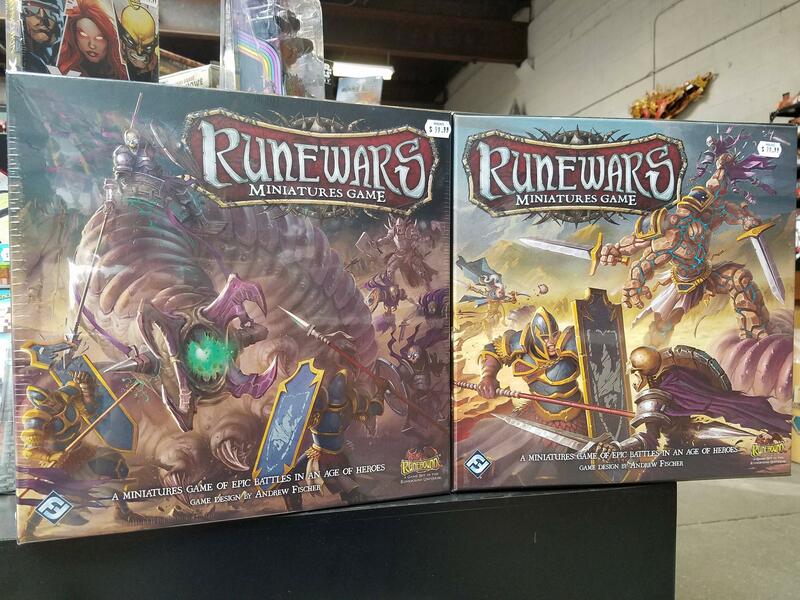 Stop by the store today to check out the Runewars Miniatures Game and check out some of the links below for more info on this awesome new release!